If you like photography and the sports camera, if you want to spend the best moments of your life, if you like breathtaking landscapes, if you want to relax or just discover Algeria with your children, then this trip is for you. Do not wait, plane tickets are limited! Request a quote now! The circuits proposed are Djanet to Iherir or Djanet to Red Tadrart. On board a 4×4 you will discover one of the wonders of the world, the Heart of the Sahara. It’s a journey filled with emotions and fairyland! Here are the 2 circuits to choose from. These are 7-day tours. DAY 01. Arrival in Djanet. Reception at the airport by 4X4 vehicle. The journey begins, you take the direction of Tegharghart “La Vache qui Pleure” (bivouac). DAY 02. Visit the engravings. You take the track towards Tikoubaouine. We visit the beautiful arch (bivouac Tikoubaouine). DAY 03. The trek continues in the valley of Essendilen. Crossing the Essendilen valley. Visit of the Essendilen guelta (bivouac). DAY 04. You take direction of the oasis of Iherir, small island of breathtaking and peaceful greenery, with its palm grove and its village. We spend a night in the zeribas of Iherir campsite (bivouac). DAY 05. In 4×4 you take the direction of Dider. Visit of the engravings (bivouac). DAY 06. You continue your return to Tilalen stopping to visit rock engravings (bivouac Tilalen). DAY 07. After a last stroll in the Tassili you take the track towards Djanet to visit the small market. You go to lunch in a garden of the palm grove. You enjoy the late afternoon at Tassili National Park, Djanet. Then transfer in the night to the airport. Return flight. Discovery of the rock sites of the desert of Tadrart (engravings and paintings). It is a real open air museum. You will discover the infinite variety of colors of the Saharan sand. DAY 01. Arrival in Djanet. Reception at the airport by 4X4 vehicle. Formalities of access to the Tassili National Park. DAY 02. Moul Naga. You continue your route to the Tadrart by stopping here and there to visit rock carvings. In the afternoon, you arrive in the area of ​​Moul Naga, the famous “stone camel” where your camp is installed for 2 nights. You enjoy the late afternoon to walk around the area, the sun ends its race and gives the area sublime colors. Dinner and night under the stars. DAY 03. In Zaouatene, In Tehak. To begin this day, you go for a stroll, just to enjoy the beautiful lights of the morning then you go, in 4×4, to In Tehak and its rock paintings. You will have lunch near In Zaouatène, it will be the occasion to admire the engravings representing in particular elephants and panthers. In the afternoon, you continue to In Tehak, where your camp is planted, in the middle of dunes, arches and stone lace. Dinner and overnight at camp, under the stars. DAY 04. Tin merzouga. It is in the setting of Tin Merzouga that the camp is set up for two nights. Walking tours and tours of the area are planned. On the program: cave paintings from the Bovidian period, the “hedgehog” carved by the wind erosion near which you picnic. In the late afternoon, you climb the highest dune of Tin Merzouga to admire the sunset and the changing colors of rocks and dunes around. The second day is dedicated to the Tin Merzouga circus and the Talafazo valley. Dinner and overnight at camp, under the stars. DAY 05. Oued In Djaren. You take the direction of In Djaren. You picnic again near a site of engravings and rock paintings where you will discover including giraffes. Bivouac. DAY 06. Tegharghart. After one last stroll in the Tadrart, you take the track towards Tegharghart “La Vache qui Pleure”. Evening in music. DAY 07. Djanet. In Djanet you visit the small market and you go to lunch in a garden of the palm grove. You enjoy the end of the afternoon at the Tassili National Park, Djanet. Transfer in the night to the airport. Return flight. 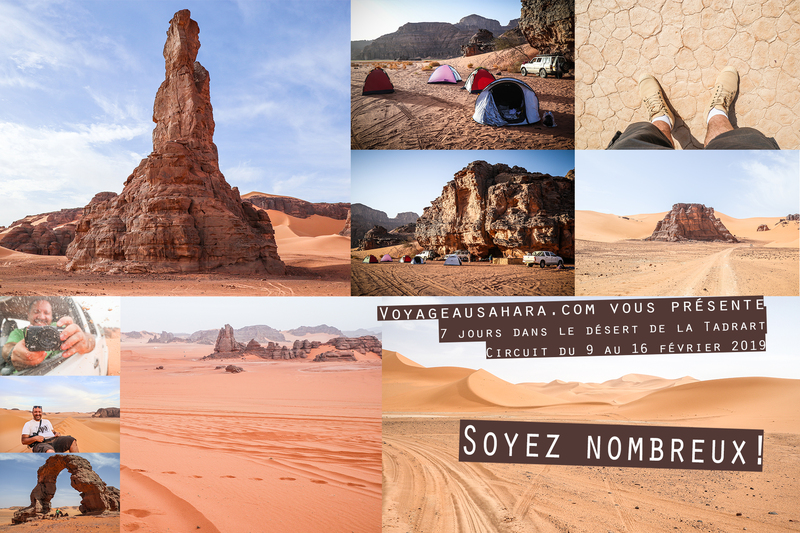 Thanks to VoyageauSahara.com you will discover the Sahara in good conditions, assisted by the best local guides of Djanet. They will show you all the beauty of the desert. The staff consists of one or more guides, one or more drivers, a cook and / or musicians. Tuareg guides with more than 20 years of experience. Circuit 4×4: adventure and discovery, escape and thrills in a magical setting. Walking moments to enjoy the grandiose panoramas, engravings and rock paintings, expanses of water and green oasis. Each night is done under the stars (bivouac) with a musical accompaniment and mint tea: complete change of scenery, under the stars and the milky way. A camping tent (2 people). But not a requirement. The guides lend tents. A light backpack for hiking and small tours. Warm clothes for the night and light for the day. A cap or a hat. A moisturizer for the face. A powerbank of 22 000mAh minimum (to charge your smartphone, camera batteries …). Wipes with plastic bags and a lighter. A kit of medicines: anti-diarrhea, antispasmodic, analgesic, anti-inflammatory. A toilet bag: soap, shampoo, toothpaste, toothbrush. The hike in the Algerian desert is accessible to all people in good health. The expeditions are in 4×4. The pace of walking is quiet. The hike is interrupted by breaks. Luggage is transported by 4x4s (with you on board). You need a small backpack to carry water, a little food, your camera, etc. The price of the circuit varies according to the destination, the number of travelers, and the duration of the circuit. Since these are custom-made circuits, the prices are variable. Individual travel insurance with immediate assistance in the event of an accident. Each confirmed registration is validated by a travel contract and the check-list to be provided. The first night is spent in bivouac. During the hike nights are spent in double tent or under the stars, according to the desire of the traveler. Sleeping mattresses and tents are provided. Breakfast: Every day there is coffee, milk and tea with bread, butter and jam or biscuits. Lunch: A daily picnic is planned every day. The meal is hearty. There are pasta (with or without sauce), rice, chorba (lamb or mutton soup, tomatoes, vermicelli and vegetables), mixed salad, meat, sardines and eggs. All foods offered are fresh and local. The evening meal: The meals are different from the lunch. They are hot. At dessert there are fruits. When it comes to water consumption, the assistance provides you with water. It is also possible to buy a pack of water or soda on the spot (at your expense). Diphtheria, tetanus, poliomyelitis and hepatitis A should be up-to-date. Anti-typhoid, hepatitis B and rabies vaccines are recommended. Consult your doctor (or the international immunization center) before booking a tour. A small first aid pharmacy is offered by the assistance. As indicated in the equipment part, take a medication kit (anti-diarrhea, antispasmodic, analgesic and anti-inflammatory) to limit the use of the collective pharmacy. The visa or passport is obligatory. Attention, the reservation of the circuit is approved only if the visa is presented 20 days before the date of the voyage (not less than 10 days). Note that obtaining the visa can be very long depending on the consulate of your city. You must therefore apply for a visa at least one month before departure. The passport must be valid for 6 months after the date of return. Each traveler is responsible for compliance with these formalities. Regarding security, it must be known that local teams are responsible and competent. They offer programs with confidence. To better evaluate a destination, it is necessary to regularly consult the heading “advice to travelers” of the website of the Ministry of Foreign Affairs in your country. Each trip cancellation, due to the Buyer, must be declared to VoyageauSahara.com as soon as possible, by email or by post (registered letter). The cancellation will be effective from the date of receipt of the email / cancellation letter by VoyageauSahara.com. An amount of 100€ per person will be charged by VoyageauSahara.com as a management fee for the cancellation of the buyer, in addition to any other cancellation charges. The insurance taken out as well as the consular expenses (visa, expenses of intervention …) are never refundable. Our VoyageauSahara.com platform does not provide airline tickets. They are the sole responsibility of the Buyer. When the Buyer cancels his trip, our platform does not reimburse any airfares. In addition to the cancellation fees specified above, in certain other cases, the Buyer will be informed prior to the sale, cancellation fees for land services (accommodation, transfers, etc.) or services (guide) may be charged. This amount depends on the sales conditions that may be imposed on VoyageauSahara.com by its suppliers. These fees can sometimes be as high as 100% of their actual cost, especially in the context of a privatization of a trip, a plane or accommodation by a group. The requirement of VoyageauSahara.com suppliers’ payment terms (air carriers or other service providers) imposes the payment of cancellation fees that are all the greater as the departure date is close. In the event of cancellation by the buyer, the refund of the amounts paid will be deducted from the amounts specified below, according to the date of cancellation. If the buyer is absent at the airport, whatever the reasons, the cancellation fee is 100% of the total price of the services. Cancellation from 60 to 31 days before departure: 15% of the total price of the services. Cancellation from 30 to 21 days before departure: 35% of the total price of the services. Cancellation from 20 to 14 days before departure: 50% of the total price of the services. Cancellation from 13 to 7 days before departure: 75% of the total price of the services. Cancellation of 7 days before departure: 100% of the total price of the services.